We have one Modern Family, Nice Mustache T-Shirt to give to one reader of our fansite — all you have to do is to post a comment telling us what was your favorite moment of the season on Modern Family. One lucky reader will win the Modern Family, Nice Mustache T-Shirt (sorry we only have one in L size) on May 31st. “Modern Family’s” Cam and Mitchell kiss. The Kiss finally happened attracting about 12 million viewers. 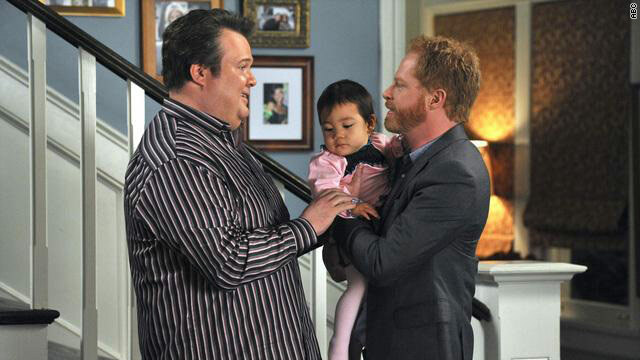 When Modern Family returns for its new season this fall, gay couple – and parents to the adorable Lily – Cameron (Eric Stonestreet, left) and Mitchell (Jesse Tyler Ferguson, right) will finally smooch, much to the relief of some fans. “We’ve had an episode planned for a long time that dealt with that subject of (their being affectionate),” Levitan tells E!. It’s just been announced that the Gay, Lesbian and Straight Education Network (GLSEN) will honor ABC’s Modern Family at the Respect Awards in Los Angeles on Oct. 8. The breakout comedy recently received 15 Emmy nominations and is being recognized for portraying positive images and storylines that reflect a diverse America – including the depiction of a family headed by a gay couple. “The opportunity to play not only a well developed gay character, but a dad, a son and brother was really appealing to me. … I chose to play him very close to myself and I think that truthfulness was appealing to the creators,” Ferguson told CNN. “Jesse and I … get so many compliments from gay couples and lesbian couples that want to introduce us to their kids and thank us for representing them on TV for the first time,” Stonestreet told Behar, from CNN. But still, “Modern Family” isn’t hitting viewers over the head with Cameron and Mitchell’s physical intimacy. “We’re the perfect show to just build it in naturally, not draw a bunch of attention to it,” Stonestreet said. For Ferguson, it’s a non-issue.